The tree and decorations are up, we don't have that much but it still worked out to be be a two day job! Ebi-kun managed to stick at the tree for quite a while, in years gone by her would put on three baubles and declare he was bored! Of course, we had 74 blue baubles on one branch and several bare patches, which is compulsory when a child decorates a tree I believe. and I will be picking up the ingredients to make the first batch of mince pies of the year. I know my Canadian friends go mad for cookies in the holiday season but in this household it is mince pies all the way. What an amazing letter! Love the paper too. My dad is English so we are about the mice pies and cookies but after spending about 1man to get all the ingredients one year I have given up on them in Japan. I'm very impressed that your make them! I have never had a mince pie, but I just googled it and it sounds yummy. I LOVE the letter, very sweet. I would love to try a mince pie! I love trying new things! 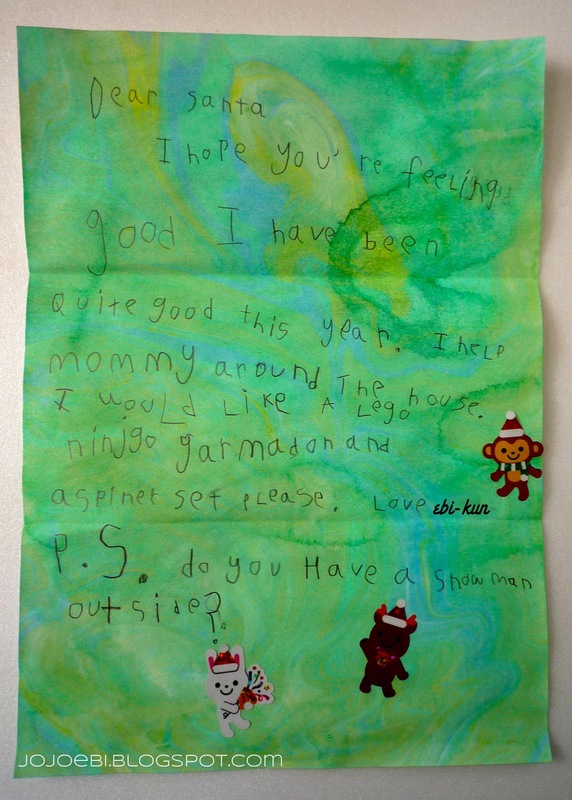 The letter is very sweet. I LOVE the PS. the mincemeat and xmas pus are not cheap BUT I don't buy speical foreign food the rest of the year so I see it as a treat to splash out at Christmas, I squirrel money away in the months running up to the big day so it isn't as painful lol.